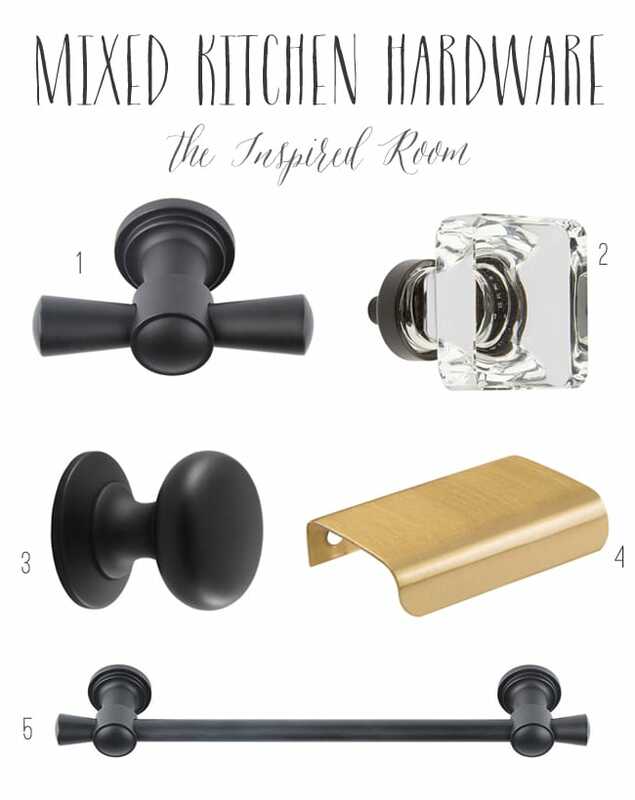 How to mix and match a variety of hardware and finishes is one of the most frequently asked questions here on the blog. It can be confusing, I agree! A few wrong choices might risk making a whole room feel chaotic. 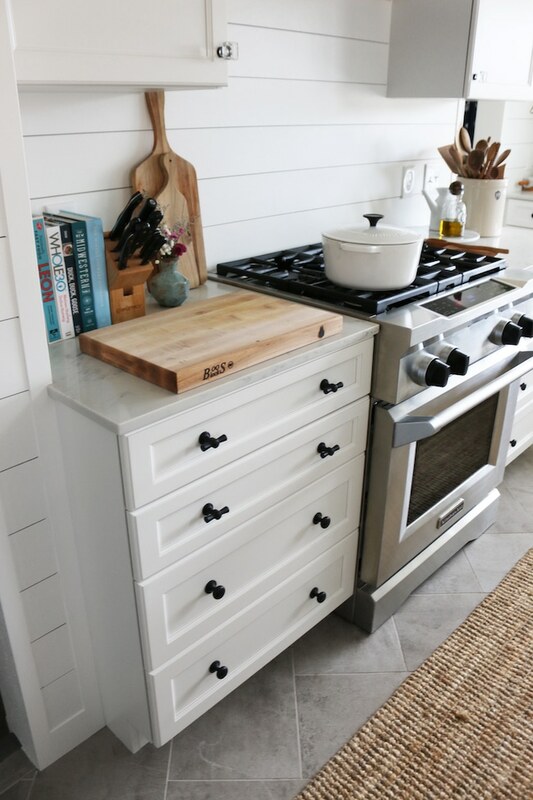 We took quite awhile to decide what hardware finishes we wanted in our recent kitchen remodel. Since we were starting from scratch, it all felt kind of overwhelming at first. Should we choose gold? brass? nickel? black? a mix? What about the appliances? What styles and finishes should go where? We were not only trying to decide on the hardware we wanted, but at first we were still considering cabinet colors, too. But once we committed to a simple black and white palette for our hardware and cabinets, the additional choices became came a lot more clear. It always helps to make at least one decision and then you can go from there. I love to mix finishes in a kitchen because I think it adds character and a timeless quality to the room. Because this kitchen is on the small side (small as in we don’t have room for double islands or dining table in the room! ), mixing hardware was going to require a bit of thought. In a smaller space, you don’t have quite as many opportunities to make changes. Too many material changes could have looked like a hodge podge of random decisions, or that we couldn’t commit so we went in every possible direction. But still, I wanted the warmth of a collected look. We decided that a fairly simplified palette of colors and finishes was going to work best for our kitchen and the mood we wanted. 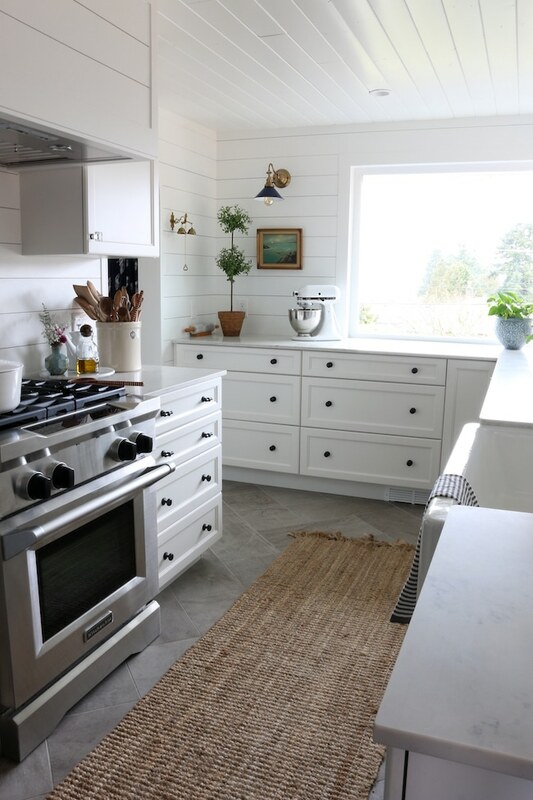 Our choice of classic white cabinets and black hardware brought simplicity to our design. We knew our appliances would be stainless, but we kept the impact of another finish to just the range and fridge (and covered the range hood and dishwasher to simplify the look). That’s where the fun could begin with a subtle yet unexpected mix of other finishes. Here’s our secret to mixing finishes: we followed a few rules we made up ourselves.We created rules for visual symmetry. These rules made sense to us and to our eye, bringing consistency and continuity to the variety :). Here are the “rules” we made up and followed. When we used a variety of black hardware, we’d use the same exact finish (same finish name, same store). All of the drawers in our kitchen would have two black knobs. 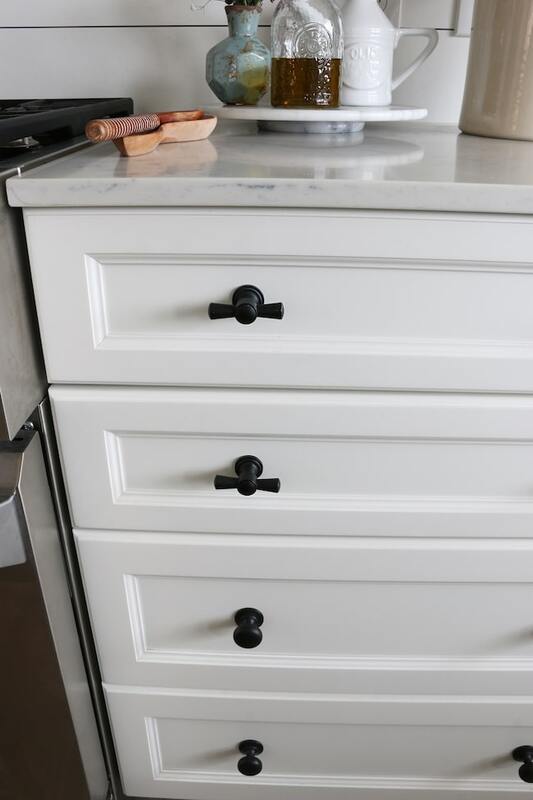 All of the drawers would have the same two round black knobs, except for the two narrow top drawers in set of four drawers on either side of the stove. 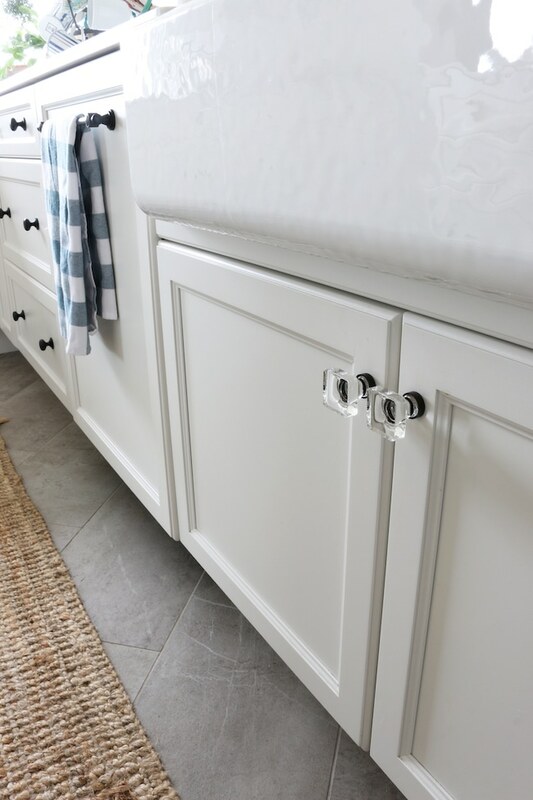 Since these two sets of drawers are on either side of a stove which also has round black knobs, we’d add a little unexpected whimsy to the mix of round knobs by changing shapes on the top drawer hardware with these nautical looking pulls. We kept a pattern of two pulls on each drawer for continuity around the room and repeated the unique hardware mix on either side of the stove for symmetry. The two similar cabinet fronts on either side of the sink (dishwasher and trash) would get a longer “bar” style black hardware. 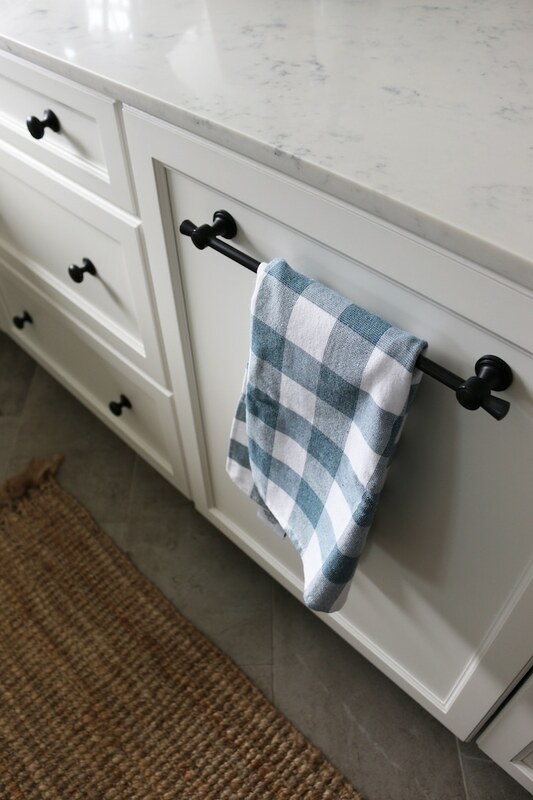 Long bars are great for pulls as well as hanging towels, which made sense near the sink. Having a long bar on similar cabinet fronts on each side of the sink brought more symmetry and balance in the room. Symmetry is another way to visually simplify a space, even if you are mixing finishes around a room. Once we made a few key decisions, we moved on to selecting hardware for the other styles of cabinets. Another rule we made up was to give every cabinet door in our kitchen a square glass knob (with the same black finish on the backing). We chose a glass square shape to add contrast and shine to all the dark rounds. :) Opposites are interesting, but glass doesn’t overpower. Sometimes you have to show restraint or break rules in design choices for the overall impact in the room to be successful. Rather than following the glass on a cabinet door rule on the tall pantry cabinets, we gave the pantry doors their own rule. 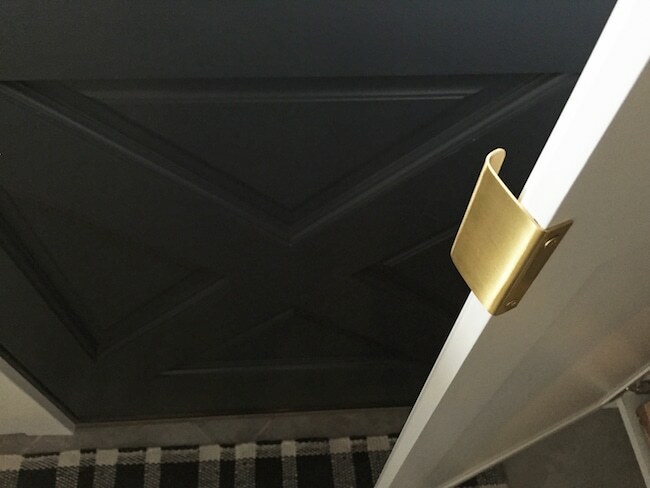 We installed slim brass handles instead. Slim brass handles were chosen for subtlety and to complement the other brass in the room. 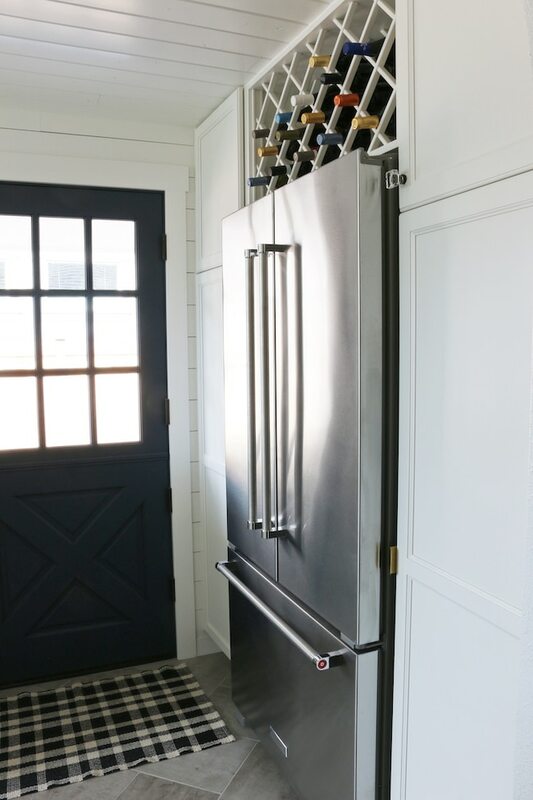 We didn’t want the pantry hardware to compete with the refrigerator (which is stainless with pulls). Anything larger would have felt too clunky, so the slim profile of the brass was just right. If you’re wondering what you’re looking at above, this is how the brass handles look when the cabinet is open! To keep the simplicity and continuity, we put black hardware on the navy Dutch door, too. After we selected our hardware, we had two more finish decisions to make. What about our faucet and the three sconces? While we entertained the idea of black sconces, we felt as though we had made enough of a statement with our black hardware. To add interest and warmth to our “collected over time feel,” we decided the faucet and sconces would be lovely in a warm brass/gold. We selected darker shades for the sconces, which helped to tie in the black hardware. The warmth and shape of the brass faucet and sconces really give the whole room a “lift.” The brass also complements all the wood and natural textures I knew we’d have in the room. That’s it! Mixing and matching a variety of finishes in room may appear more complex than it actually is, but if you stick to a few reasonable rules the results can feel refreshing and pleasing to the eye. We are so happy with how all the details came together. We really love having a variety of finishes in the kitchen. Bonus of this subtle yet interesting mix is we won’t ever grow tired of it, but the simplicity makes it easy to add new colors and patterns to the room if we want to change things up! Shop my hardware with the linked numbers above or by clicking the above photos. See the full kitchen reveal post and the entire source list here. 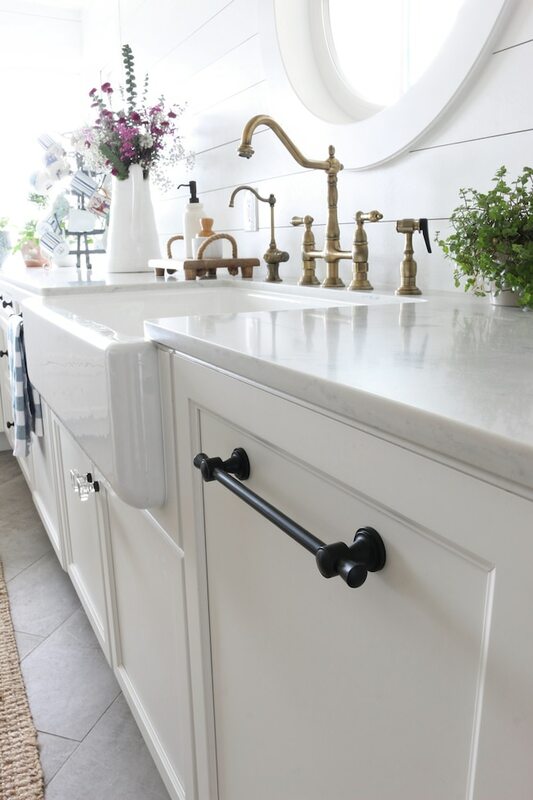 Get inspired by other kitchens with black hardware in this inspiration post (including more great sources for kitchen hardware). You’re welcome! Ha yes, it’s like there are no real rules but then you make up some to give yourself something to follow. And then you break the rules again. Clear as mud, right? Melissa, I just love reading your posts. The new kitchen is beautiful. 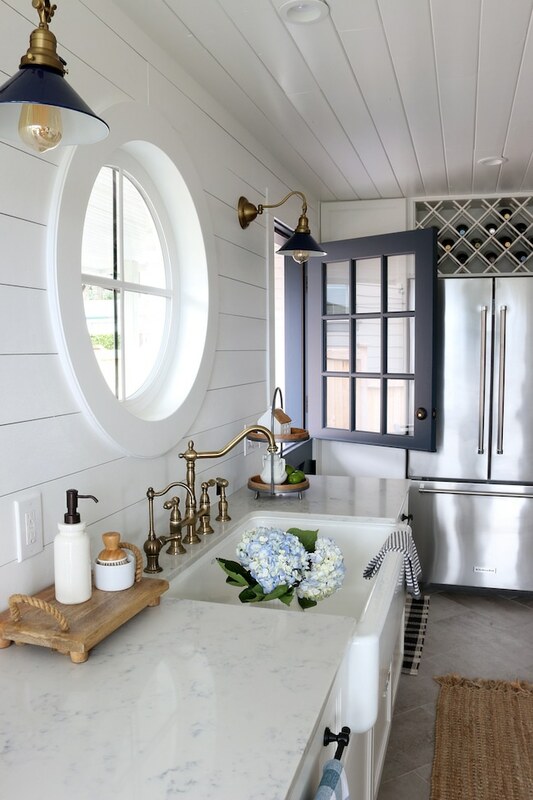 The Dutch door and porthole window just make me swoon! Thanks for your info on choosing hardware. I think it’s hard to do, and it is helpful to read how you gave some definition (with your own rules) to make selections that don’t look haphazard. I have been thinking about my upstairs bathroom hardware and I think this will be helpful. These are details I hadn’t picked out in earlier photos of your kitchen. I was always distracted, I think, by the overall dreamy, collected look and didn’t stop to analyze it. All your choices fit together so well and accomplish exactly what you set out to. Am bookmarking this for future use! Thanks again. What a great “tutorial” to bring the kitchen to real harmony and beauty. 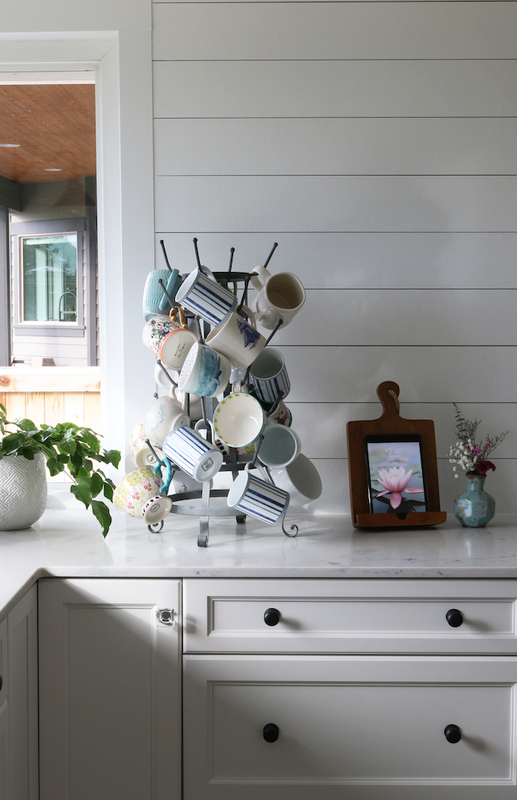 When we redid our kitchen (before blogs) we could see that the hardware was important—but how to figure it out was the question. It stalled us for a year! I love your process! Your thinking and your re-telling of it are unique on the web. Since we were older we also considered the feel of the pull in our hands (some of the pulls were rough on the back side) and the grip necessary to use them. Your kitchen is just awesome in every detail. Thank you so much for sharing the beauty and the process with us. So sweet, thank you for your comment. I agree with you, I must have a smooth feeling finish! And you’re so right to have thought through the grip for your needs. So many considerations, but worth every minute of planning! Your entire kitchen is quite lovely, and I do adore all the choices you’ve made in the decor. However, I personally worry about adding the shiplap look to my own walls, thinking that it is trendy and not good for resale value down the line. While it’s very ‘in’ right now it could soon be out, so to speak. It’s also not a wall treatment that can be easily changed out, so I do wonder what your thoughts are on that? Oh I wouldn’t worry about painted wood paneling or planked walls getting dated or taking away from resale value if they are quality and appropriately installed. Wood paneling and planks on walls and ceilings have been used FOREVER in homes (I’ve had them in every single home I’ve lived in, long before they were “popular”). Sometimes certain classic elements become “trendy” or more popular again for awhile, but when they are used appropriately in a home they will still stand the test of time even when the current design frenzy is over. It’s like subway tile or white plaster walls, the look never gets dated. 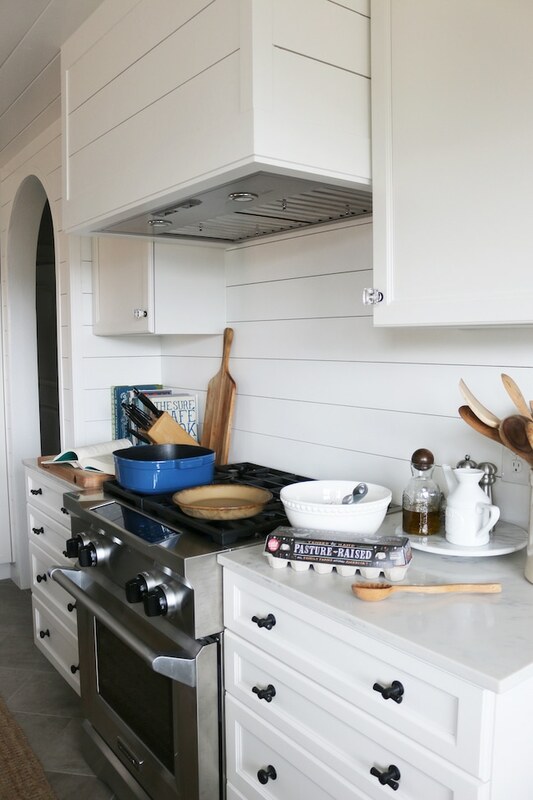 Along with our planked and paneled walls, I’ve also had white plaster walls and subway tile in many of our older homes since I was a little girl. Not because it was trendy to have white plaster walls or subway tile, it’s just always been a classic look for those homes. Those elements will continue to be a great backdrop for a room. If the only time you ever saw painted paneling or planked walls was in the year 2016 then I’d worry that it will be a fad. But if you look at 100 year old houses, they had wood walls and planks (horizontal, vertical, beaded, grooved, board and batten … all styles). If a design or architectural feature you are adding to your home is tied specifically to a certain time period, then it’s more of a concern to use it in great quantity. But with classics you can safely install them and even freshen them up and it’s still going to be classic. You can have basic subway tile and use it in a herringbone pattern if you want a new look, but it’s still a classic material. If you started adding cheap looking poorly installed ugly paneling all over your house, I’d be concerned. But in my opinion, when you do quality work, use classic looks and materials and install it in a way that feels appropriate to the home, there’s really no need to worry, even for resale! I really liked your thought process with your choices and placement of your hardware, faucet and lighting. It’s stunning, unique and I feel you’ve achieved the collected, curated look you were after. Just beautiful. You continue to inspire! Thank you. Thank you, as always, sweet Jo Jo! I always look forward to and enjoy your comments, it’s been so nice to have you as a friend (even though you live in my computer, ha! I know I’d enjoy hearing from you in real life, too)! Loving the hardware you chose. It looks just perfect and have I mentioned I love your kitchen! Where did you get the wooden cutting board with the rope handles beside the sink? Beautifully done. When I look at the Hardy plank boards one of the edges is smooth while the other edge has a little bit of a lip on it . Did you cut the lip off or how did you work around it? Did you caulk in between each board? What color did you paint the shiplap? Is it the same color as your cabinets? Hello! Love your kitchen!!! We re-did ours about 7 months ago but we still haven’t picked out hardware! We have white cabinets on top and a medium grey on the bottom. All the hardware in the house (bedroom door knobs and door hindges) are brushed nickel. Can I do oil bronzed or black pills/knobs for the kitchen doors and drawers? Thanks so much for your help! Hello! I just love your kitchen. Thank you for sharing all of your ideas and your thought processes. It has been very helpful to me so thank you so much for sharing! 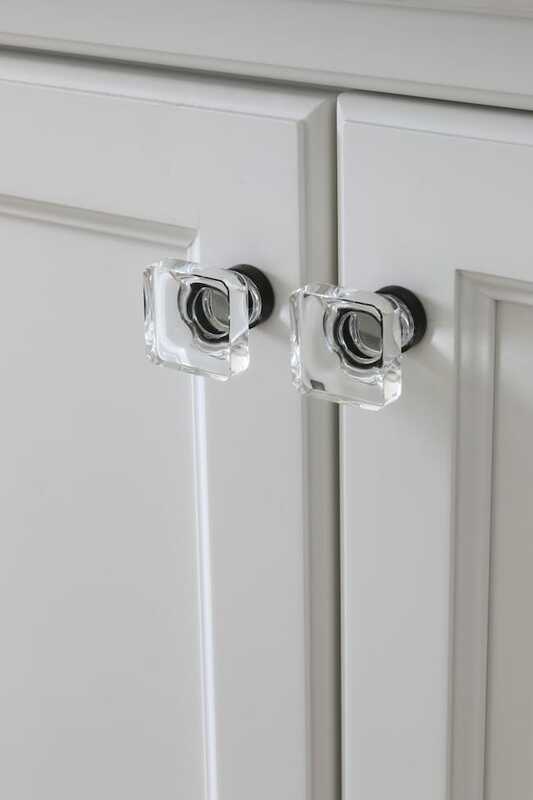 I am ordering the black knobs for my kitchen and would like to order the glass square knobs as well, but it seems as though Rejuvenation is no longer selling them. I can certainly look elsewhere, but I want to be sure the black knobs match well with the black backing of the glass square knobs. Should I assume that any glass knob with a black backing would coordinate well with the black knobs?